This fall, the windows of 808 Commonwealth Avenue have had students stopping in their tracks. Since September 15th, the space that makes up Boston University’s 808 Gallery has been dominated by massive inflatables, attention grabbing because of their scale, bright colors, and abstract shape. The pieces are the centerpiece of 808’s fall show (((CRZ.F.4NRS.AAK))), a solo exhibition by Scottish artist Claire Ashley. 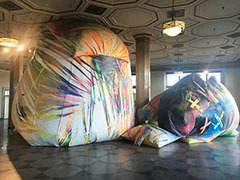 Consisting of roughly thirty inflatables ranging in size from a few feet high to scraping the ceiling, as well as thirty small paper pieces, the installation is a playful experiment with space, combining the sculptural element of the inflatables with neon, graffiti-like colors. Ashley has worked with inflatables for a decade, inspired by their energy and movement. Supported only by air, they seem to breathe and pulsate, yet, in its absence, they become limp and lifeless. This lifelike quality inspired the decoded title of the exhibition, Crazy Female Foreigners Alive and Kicking. The constant motion of air required to keep the inflatables on display, combined with the sheer amount of space they demand and their curvaceous forms, make the inflatables impossible to ignore, an effect Ashley hopes connect them to the female foreigners of the title. The exhibition has captured the attention of the BU community, which has found Ashley’s whimsical, unusual pieces impossible to ignore as they make their way up Commonwealth Avenue. The BU Art Galleries often go ignored in favor of the myriad of other museums and galleries in Boston, but this one has proven popular, garnering as many as fifty visitors on a weekend day. It’s still not a lot, however, even though 808 is the most-visited of the three BU Galleries. The other two galleries, the Annex and the Faye G, Jo, and James Stone Gallery, remain tucked away in the College of Fine Arts, where their existence goes largely unknown to those outside CFA. That’s a shame because while the scale of these galleries is smaller than Ashley’s spectacle, they are still exciting spaces to explore the works of contemporary artists as well as CFA students. The Stone, which has just completed its annual showcase of undergraduate art, is hosting the debut Boston solo exhibition of Geoffrey Chadsey. Entitled Heroes and Secondaries, the exhibition consists of pencil and crayon portraits on translucent Mylar, subverting societal expectations of the male body in a way that is both bold and humorous. Chadsey’s background as a photographer shines through his careful rendering of naturalistic, touchable, yet impossible forms, and his details make the subversion of gendered bodies even more jarring. The figures are isolated, forcing the viewer to consider the bodies before them as well as our expectations of gender presentation and socialization. It is provocative, layered, and amusing all at once. Even more tucked away, behind an easily-missed door next to the Stone is the Annex: a tiny, intimate space, perfect for the current exhibition. Private Screening: A Selection of Experimental Film is an hour of innovative films from ten New England artists tackling themes ranging from death to consumerism. The small space creates a focused viewing experience, allowing the viewer to contemplate the films as they become fully immersed in the aural and visual experience. They may be hard to find and small in scale, but BU’s art galleries are fantastic spaces to experience the works of contemporary artists - their innovation, passion, and talents - in addition to the next generation of artists at CFA. Every semester brings new works to view and enjoy. Make the trek over the bridge and learn more! Sign up for our Newsletter to receive the latest updates from Squinch!